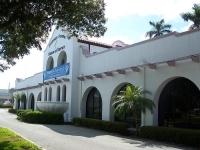 The Southwest Florida Museum of History chronicles the history of Southwest Florida, from the Paleo Indians through the Calusa, the Seminoles and the Spanish explorers to the early settlers. A pioneer cracker house, a 1926 fire pump and a 1929 Pullman private railroad car are among the exhibits. Pride of place is held by the 'Land of Giants' section depicting the huge animals like mammoths, mastodons and the Bison Antiqus that roamed the area about 12,000 years ago. The museum also hosts regular travelling exhibitions. Guided tours are available and there is an audio guide in both English and Spanish for those who prefer to explore independently.